Mashabim's idyllic rustic-style guest rooms are spread out among various 1 and 2-story buildings, all located on expansive green lawns complete with sitting areas, that offer a serene Negev experience. All the rooms are air-conditioned and outfitted with a coffee corner, plasma TV, mini fridge, hairdryer, and outdoor sitting area. The guest rooms are conveniently located near barbecue spots with outdoor furniture, so guests can enjoy picnics surrounded by nature. Please note that the rooms are not equipped with kitchenettes, so it is not possible for guests to cook in their rooms. 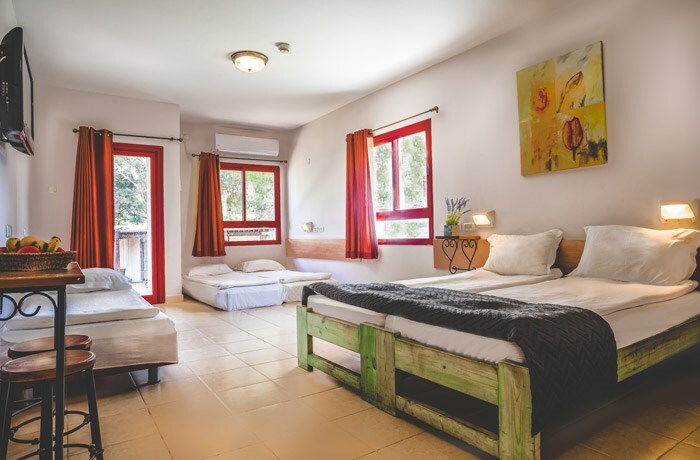 The spacious, comfortable rooms are suitable for individuals, couples, and families of up to 5 people, and are perfect for anyone seeking the ideal southern Israel getaway. Check-in is from 3:00pm, and check-out is until 11:00am daily. Please arrange late Saturday check-outs with Reception in advance. Double Room includes LCD T.V, A/C, refrigirator, electric kettle with tea and coffee, wi-fi free of charge, sitting area. Triple Room includes LCD T.V, A/C, refrigirator, electric kettle with tea and coffee, wi-fi free of charge, sitting area. Up to 3 person in the room. Quad Room ground floor includes LCD T.V, A/C, refrigirator, electric kettle with tea and coffee, wi-fi free of charge, sitting area. Suitable for couple and two children or 3 adults. Quad Room High floor includes LCD T.V, A/C, refrigirator, electric kettle with tea and coffee, wi-fi free of charge, sitting area. Family Room ground floor, includes LCD T.V, A/C, refrigirator, electric kettle with tea and coffee, wi-fi free of charge, sitting area. Suitable for couple and three children. Family Room High Floor, includes LCD T.V, A/C, refrigirator, electric kettle with tea and coffee, wi-fi free of charge, sitting area.